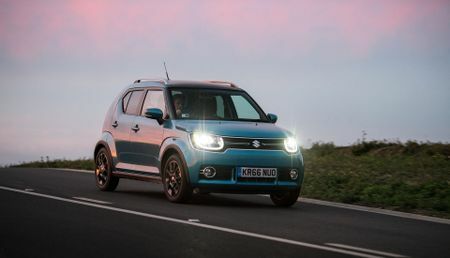 With wholly distinctive looks, a decent amount of usable space, plenty of standard kit and a big dollop of interior pomp, the Ignis looks destined to become a highly desirable city car. It’s no ball of fire, it’s not the most refined car, and you definitely don’t want to look too closely at the material quality. But for this type of money, it’s difficult to criticise, because at the end of the day, the Ignis’ cheeky character does put a big grin on your face. Choose the lower trims and it also looks incredibly good value for money, especially as the cheapest, front-wheel drive versions are also the best to drive. However, there is a caveat, and it’s a significant one: only the top trim cars get what we would consider the requisite amount of safety kit as standard, while lesser models are less than satisfactory. 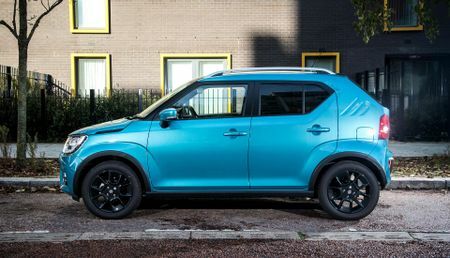 Suzuki claims the Ignis is the first car of its type, so in a class of one, it’s hardly surprising that it also reckons everything about its cute ‘urban crossover’ is class-leading. Until the inevitable stampede of similarly configured vehicles come galloping over the horizon, the only real rival for the four-wheel-drive Allgrip version, is the ageing Fiat Panda Cross 4X4. The front-wheel-drive Ignis will be by far the best seller however, so for now, it will be fair game for funky city cars such as the Volkswagen Up, Renault Twingo, and the immensely popular Fiat 500. One thing’s for certain, even surrounded by these hipsters, the Ignis is sure to get you noticed. 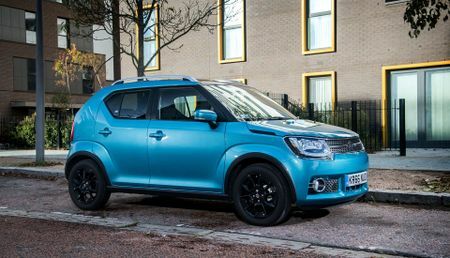 With its hatchet job styling, complete with clamshell bonnet, raised ride-height, silicone-enhanced wheel arches and dark alloys, the Ignis comes with more street cred than a Shoreditch loft squat. 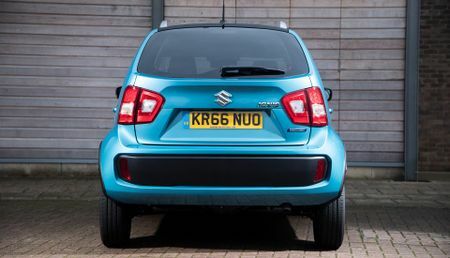 There’s even a nod to a time when cheesecloth and curly-perms were all the rage, including the use of three bold stripes on the rear quarter panels (which apparently pay homage to the engine cooling air-vents found on Suzuki’s funky 1970s Whizz Kid city car). What a certain German sports shoe manufacturer will make of these, goodness only knows. Anyway, back on less esoteric ground, in keeping with the compact dimensions, the Ignis’ engine is also on the dinky side. Power comes from the same 1.2-litre Dualjet petrol engine, that produces 89bhp, and is found in the Swift and Baleno hatchbacks. There’s no diesel option, but the Ignis is available with what Suzuki refers to as its SHVS, Integrated Starter Generator system. In layman’s terms, it’s effectively a mild hybrid that employs a lithium-ion battery stored under the front seat which feeds a belt-driven electric motor that assists the petrol engine. 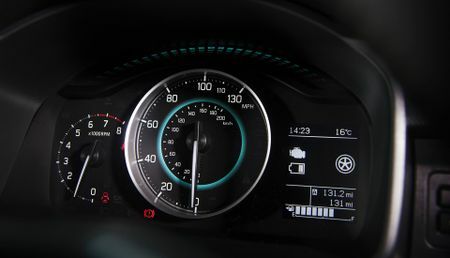 This gives an additional boost of acceleration, but in truth, the real purpose of the system is less about increased oomph, and more about taking the strain off the petrol engine to help reduce CO2 emissions. The Ignis also seems almost unfeasibly light. With the base model claimed to weigh in at 855kilos, that’s five bags of sugar lighter than a featherweight Renault Twingo. Although It would be wrong to suggest the Ignis’ diet has in some way contributed to its poor Euro-NCAP performance, a 3-star rating for a new vehicle in this day and age is not exactly an encouraging start. Thankfully, you can improve that performance either by going for a top trim car, or specifying extra safety kit as part of an options pack. Pretty entertaining really. Despite a 0-60mph sprint time that wouldn’t scare a librarian’s book trolley, the Ignis’ bantam weight and grippy chassis means you can fling it around with a fair bit of joie de vivre. The engine loves to be revved mercilessly and the gearshift is a little sweetie, so buzzing along, zipping in and out of traffic and wringing every ounce of performance out of the motor is a proper hoot. The steering is a bit sticky – our test car in particular had very little in the way of self-centering, so once a steering input had been applied it would doggedly stick to that course, long after the pressure on the wheel had been released. The ride is not particularly cosseting either. The body control is well sorted, so things feel reasonably relaxed on the motorway, if not all that quiet, given the healthy chorus of road- and wind-noise chiming away in the background. That control also means there’s little in the way of nose dive, even when braking hard from speed. And because body roll is well checked, there’s never any danger of you clouting your head on the side windows when harrying into tight turns. That said, dropping an inside wheel into a gutter or a sunken drain cover does create quite a bit of sloshy side-to-side body shimmy. On top of this, the rear axle all too often feels like it has set up a bouncy castle and is having a whale of a time. Pounding over lumps and bumps with gay abandon, it can get pretty animated and sound pretty rattily when the going gets tough. Inside, the Ignis may not be big on material substance, but it has a proper breath of fresh air about it. With contrasting acid blue and Jaffa orange instrumentation, and what looks like a discarded thermos flask turned on its side to house the air-conditioning controls, along with a row of ancillary toggle switches, it’s a refreshingly cheerful treatment, especially compared to the rather bland cabins we’ve gotten used to in the Vitara and SX4. Additional colour-coded flourishes around the gearlever and internal door handles are mirrored by a painted centre console stamped with a repeat of the three stripes found on the rear wings. Unfortunately, the steering column only adjusts for height and not reach, and when we say adjusts, we mean, it nose dives onto your lap like an anvil off a cliff as you unleash the locking lever. Not to be outdone, the glove box crashes from its mooring with a proper wallop. Although the overall ambience is undoubtedly funky, it pays not to look too closely at many of the fixtures and fittings, as many exposed screw heads are openly on display and the pallid swathes of plastics, especially those on the doors, have all the allure of a recycled washing-up bowl. 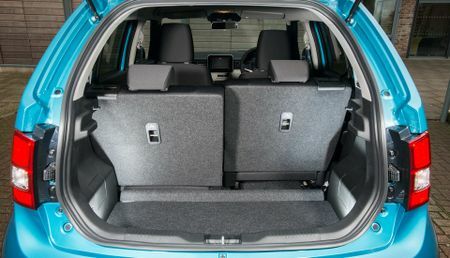 There is however a decent amount of space for four to travel in reasonable comfort, and a half decent boot that’ll accommodate a quartet of squish sports bags. 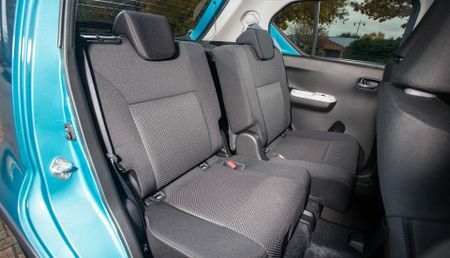 You also get five pews and 60/40 split rear seats on the base model, however if you step up to SZ-T trim, the three rear seats become two, which slide back and forth and divide 50/50. A must have touch-screen for the infotainment system, that links directly to your smartphone, and incorporates Android Auto and Apple CarPlay is standard on all Ignis models, as is air-conditioning, a DAB radio and Bluetooth connectivity. 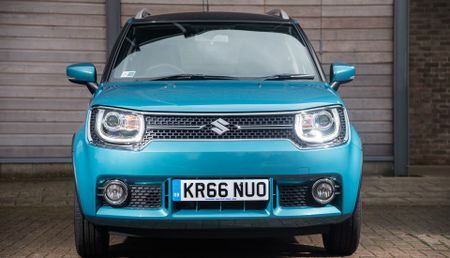 Top-spec SZ5 trim includes sat nav, keyless entry, dual-zone climate control and LED headlights, but more crucially, it adds the ‘Dual Camera Brake Support’ (DCBS) pack, which includes autonomous emergency braking and is claimed to greatly improve the Ignis’ Euro NCAP safety score. 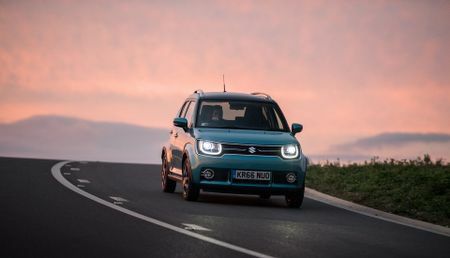 If we’d been a little less circumspect, we could have easily jumped to the conclusion that the cheapest front-wheel-drive car in SZ3 trim would be the Ignis of choice. 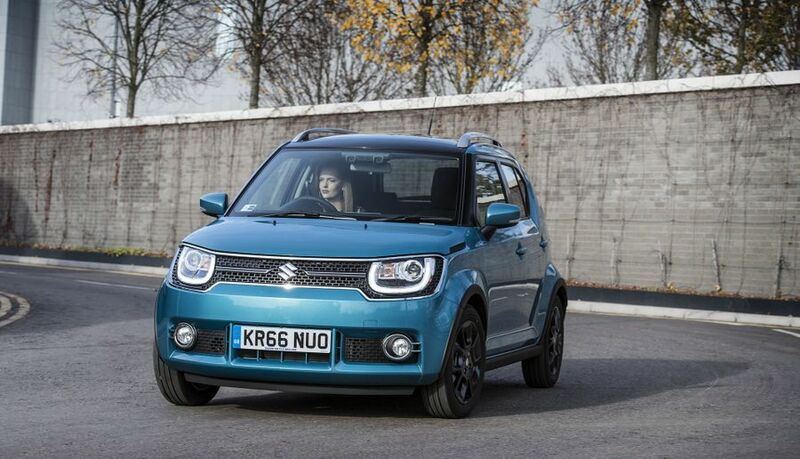 Although we still believe the choice of powertrain to be correct, having gotten wind of the Ignis’ Euro NCAP results, we’d point you in the direction of the higher SZ5 trim, which comes with additional safety kit, including autonomous braking to help keep you safe. Either that, or tick the options box for the additional safety kit. The Up is not the cheapest example in the class, but it serves up everything city car buyers love. It’s stylish, high in quality, fun yet comfortable to drive, and even reasonably practical. The Fiat 500’s funky looks have made it one of the most popular city cars in Britain, and buyers also love its cool, retro interior and cheeky character. It may not be as outrageous to look at, but the Hyundai i10 is one of the best city cars out there. It’s good to drive, immensely practical, and worth every penny.